May is the month when the kadamba tree (Neolamarckia cadamba) yields fruit—those yellow-orange ball-shaped fruit, the size of golf balls. It’s that month when the sun is really, really harsh. It also happens to be the month when most deaths due to the heat wave occur. It’s not the month when you would like to venture out in the open (contrary to the claims by sun-screen TV commercials). If you do, do venture out early in the morning or late in the evening and tilt your neck towards the sky while standing below a tall kadamba tree. I’m sure you’ll see a marvel. The crown is a canopy of branches, like an outstretched palm with leaves sprouting all around, as if an umbrella held over you. 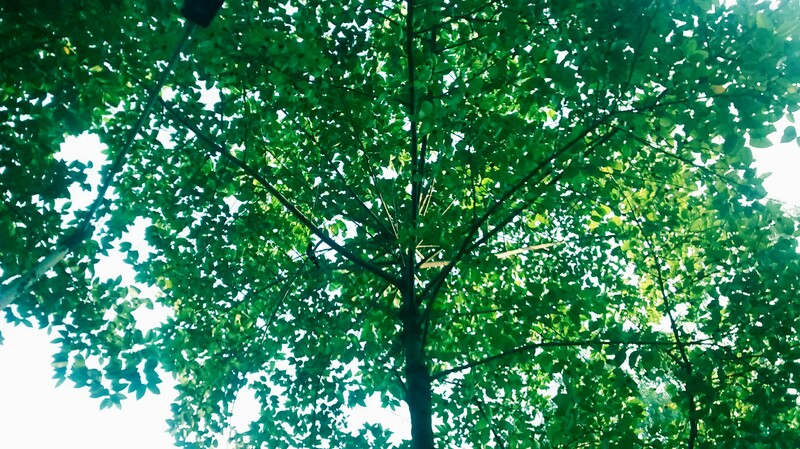 If you lie and stretch yourself (not possible because kadamba trees are used as avenue trees in cities) you’re likely to be awe-struck by what I call the nature’s wonder. The marble-white of the sky peeping through the speckles of green, reminding you of an embroidered sari you inherited from your grandmother. 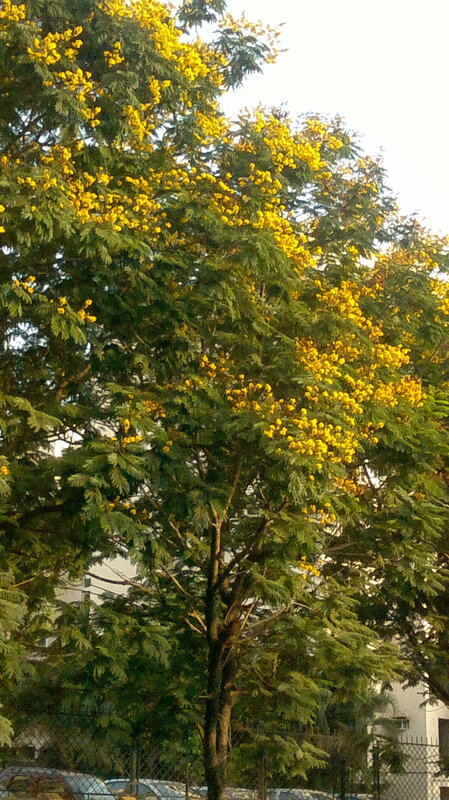 A favourite of Lord Krishna, kadamba tree and its flowers is consider a universal favourite among the Gods. In fact, the Mother Goddess Durga is said to reside in a kadamba forest—for she is lovingly called Kadamba Vana Vāsinī. The fresh leaves are edible and a favourite fodder among cattle. The ornamental tree, used for soil reclamation sheds large amounts of leaf and non-leaf litter which on decomposition improves some physical and chemical properties of soil under its canopy. The fragrant orange flowers attract pollinators like bees, butterflies and birds. Furthermore, this tree can grow best in alluvial sites like river-banks and in the transitional zone between swampy, permanently flooded and periodically flooded areas. Come rains, the branches lashed by wind the kadamba fruit–by now ripe and coloured bronzed brown– drop on the earth, one by one. In the mornings you’ll see scores of them lying around. Of them, some will grow to be a tree continue the life cycle. Adivasis of Chattisgarh believe that planting kadamba trees closer to lakes, rivers and ponds, brings happiness and prosperity. Rabindranath Tagore mentioned the kadamba in one of his poem: Badal diner prothom kodom phul. I have something in common with John Milton and Shakespeare. I am serious. Though neither a poet nor a playwright as these distinguished gentlemen of yore were I still consider them to be my friends. Let me come to the point. The author of “Paradise Lost,” is said to have planted a mulberry tree at Cambridge and at Stowmarket, and these trees thrive to this day. Shakespeare planted a tree at Stratford-on-Avon, which supposedly came from the mulberry garden of James I. Though this tree was chopped down, a few cuttings of it were transplanted at various spots around England, and the wood from this tree was fashioned into countless mementos of the poet and playwright. 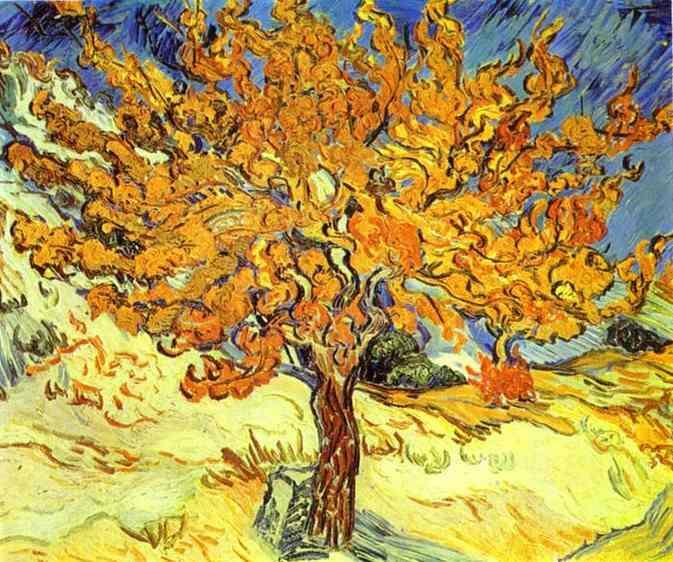 In fact, my inspiration to plant a mulberry tree in my orchard after having seen a reproduction of Vincent Van Gogh’s painting, Mulberry Tree. If you have an orchard you need to have a multi crop orchard unlike my farm-owning neighbours who beside mangoes having nothing else. They wait or a year to get the mangoes. While I feast on jackfruits, cashew, amla, coconut, mulberry chickoo et al year round they wait for their Alphonsos and Neelam. March is the season of mulberry when its slender branches hold tiny fruits which turn pink and then red while ripening, then dark purple or black, and have a sweet flavour when fully ripe. 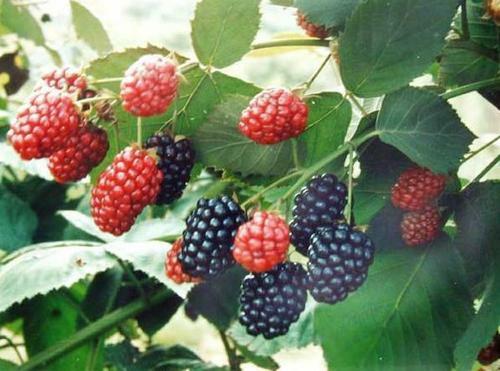 In fact, Mulberry is among the rarest of those fruits which fruits twice a year. Once in the summer months—February to April— and then during the monsoon months—late July-September. Refreshingly succulent, tart and sweet mulberries are indeed rich in numerous health benefiting flavonoid phyto-nutrients. Mulberries are favourite of the birds and easy to grow. Have a mulberry and you will witness the winged guests visiting your orchard. Planting a mulberry is easy. Planted from large cuttings they root readily. Do it during the monsoon. I have come to the conclusion that one needs to be really fortunate to consume these easily perishable fruit. For you hardly find them in the market. It’s been two years since my Ipomea for which I paid a premium has been flowering but I’m still for Waiting for The Godot moment! 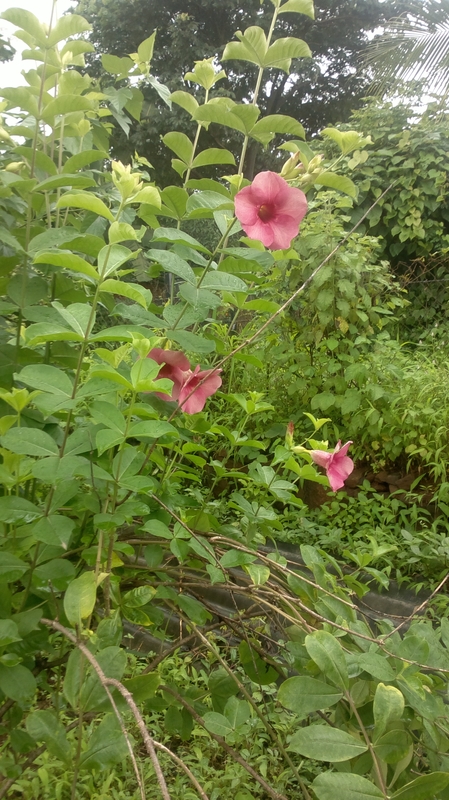 Ipomea often grown as ornamentals attract butterflies especially the pink headed hawk moth or even hummingbirds. Having seen hummingbirds in documentaries I have always wanted to see hummingbirds in person and so had planted a Ipomea. Last year when it flowered I waited for a hummingbird to visit my farm. This year too I hoped and waited. Unwilling to take any more waiting I googled Ipomea and came to know that I need to visit the Americas–from southern Alaska to Tierra del Fuego, including the Caribbean—to see one. Meanwhile I leave the pink headed hawk moth to visit them. In our rush to carry on the business of life we miss the fragments of beauty strewn around us. Unable to recognize it we fail to enjoy its importance and splendour. Only when they are not around we will surely miss them. Come April you may have seen streets, roadsides and grounds of parks strewn with yellow flowers. I also noticed it recently after having read Common Trees by Dr H Santapau. 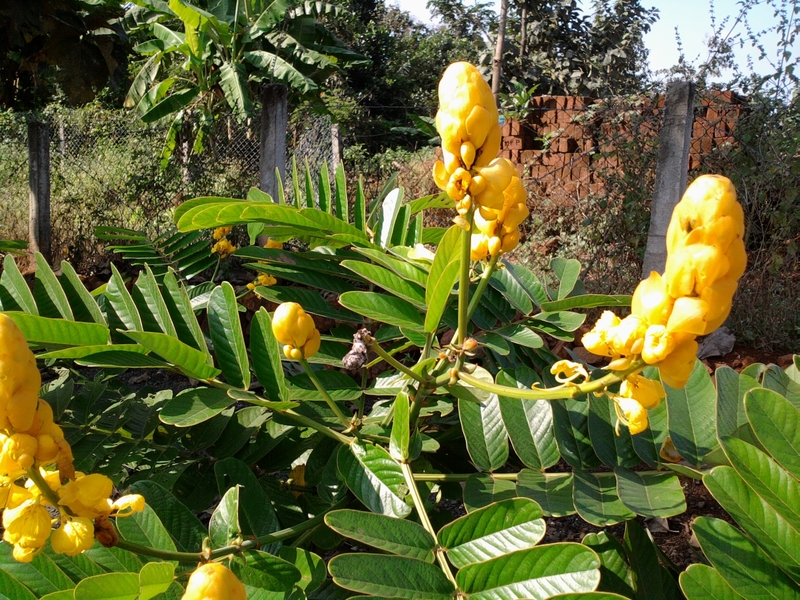 The tree (Peltophorum Pterocarpum) also called the copper pod tree, is found in large numbers in our city, with a spectacular display of brilliant yellow blossoms. The flowering season commences at the end of February and reaches its peak in the middle of April. The canary-yellow flowers, with strangely crinkled petals, clustered on upright stalks at the end of branches, present a breath-taking view in summer. 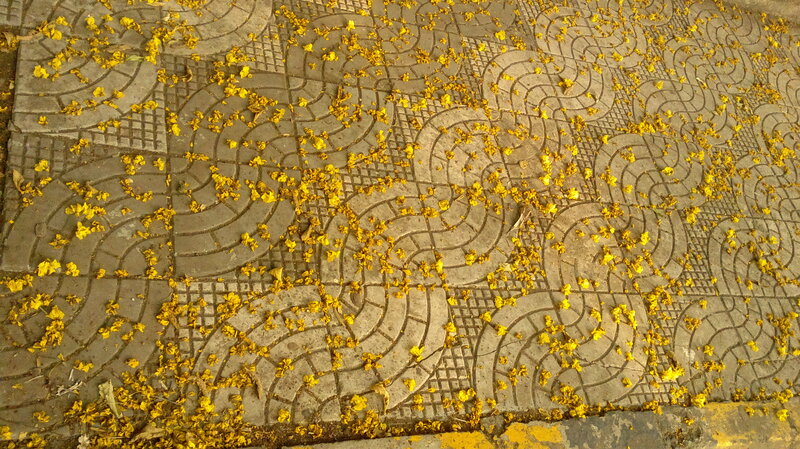 While still fresh, they fall off the trees, forming a radiant carpet of bright gold. Excellent shade providers, they are home to golden orioles, coppersmith barbers, spotted doves, mynahs, squirrels, bats and lizards. The pollen and nectar attract bees and insects which in turn attract insectivorous birds. 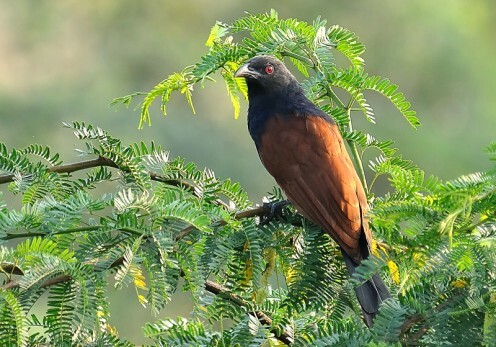 In the countryside which we visited during our summer vacations it was believed that if one has sighted the Greater Coucal one can be sure that summer is at hand. Reason, the bird which belongs to the cuckoo species is also called the summer bird. I saw a crow pheasant, its other common name; sunbathe on the top of a tree with its wings spread out. Soon it swopped on the ground and hopping picked up worms. Soon another one appeared and called up—repeating a booming low coop-coop-coop with variations. In southern parts of India, says my wife, that one is considered lucky if s/he has sighted a pheasant crow. That was enough to give me an idea: I have bought an Rs 1 cr. lottery ticket. Ever since I saw them growing in the small patch of garden, parallel to the tracks at Dombivali Station and maintained by the malis of Central Railway I had wanted to grow them. The flowers at the end of the stem were long and only later did I come to know that they were called “Candle Bush”. I bought a sapling from Yamunabagh Nursery at Badlapur and planted it last October. “Did it rain,” I ask Billal, my autorickshaw driver, who picks me up from Badlapur station on Sundays and later drops me back. The roadsides are damp. The fields still holding the stalks of harvested paddy. “It rained very heavy on Saturday evening,” he answered. There was surprise waiting for me at the farm. The soil was damp, the trees heavy with raindrops and the day still cloudy. November is the best time to be outdoors. Yellow flowers greeted me, grown from a bush hardly three foot from the ground. A perennial shrub, the flower resembling fat candles. You’re unlikely to come across such pure yellow colour in nature as in this flower. That’s reason it attracts bees and butterflies. Also called ringworm shrub, it belongs to the gulmohur family and is called Dadmurdan in Hindi. Its Botanical name is Senna alata. The leaves are commonly used for treatment of ringworm and other skin diseases. The decoctions of the leaves are also used to treat bronchitis and asthma. Because of its anti-fungal properties, it is a common ingredient in soaps, shampoos, and lotions in the Philippines. Attracting birds and butterflies to your outdoor living space is not difficult to do if you welcome them with a long-term source of food, water, and a place of safety. It means planting the kinds of flowers, shrubs, vines, and trees that provide berries, seeds, and nectar, a nesting area that is protected from predators, and fresh water for drinking and bathing. And, yes, you can do all that in a small space with container gardens, and even if you are a city dweller, birds and butterflies will accept your yard, patio, deck, or balcony as a wildlife oasis and pay regular visits. Planting sun-loving plants: Grow sun-loving flowers (i.e., particularly those that grow wild in meadows) in your patio garden planters to attract songbirds, hummingbirds, and butterflies. Choose brightly coloured flowers like the purple coneflower (echinacea pupruea), which produces enough seeds to feed birds well into the winter. Butterflies, hummingbirds, and orioles love flowers with abundant sweet nectar (e.g., the bleeding heart, or dicentra eximia; honeysuckle vines, or lonicera, both perennials). Be sure and provide a trellis, twine, or wire against a wall so that your vines can climb and cling. Annuals provide blooms all summer long, but it’s nice to have a variety of perennials, too, that burst into flower at staggered intervals offering seeds and nectar from spring to fall. Select plants that grow well in your area. Supplement the food provided by your container gardens with a birdfeeder and a supply of commercial seed mix to attract a variety of birds, or a hummingbird feeder with sweetened coloured water, and a goldfinch feeder with niger thistle seeds. These last two feeders are great because the squirrels can’t get into them. 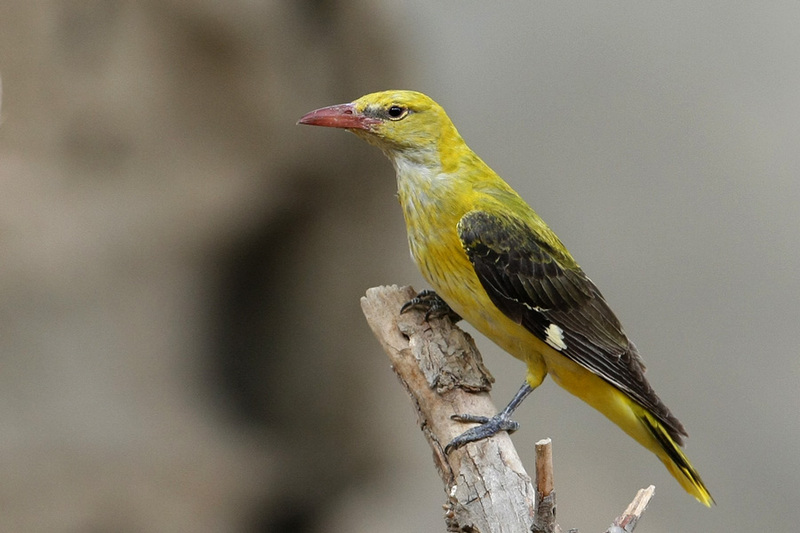 Insects attract birds, too, and our feathered friends will be eating every pest in sight, including mosquitoes. You don’t have to do anything to attract a particular insect, of course, and every yard has plenty. Organic gardening attracts more wildlife, too – all of it: birds, butterflies, and insects. They know what’s good for them, and it’s good for you, too. Fresh Water is needed: You can buy a birdbath, a fountain, or construct your own water garden with an appropriate garden planter. Buy a waterproof container (e.g., consider plastic planters or ceramic planters) or use a waterproof liner. Make sure the drainage hole is plugged. Make sure the container is shallow and the water is no more than two or three inches deep – that’s what birds prefer. Vegetation planted around running or dripping water is great for attracting birds and butterflies (butterflies like to take a drink, too). You can buy a little fountain or a drip arrangement to fit into your container. Make sure the bath is placed high enough to be secure, which means too high for a cat to reach it. See that there is a perch, or a level rim, or rocks placed in the container so that your birds can walk into the water to safely bathe or sit and dip their beaks into it. Provide a Shelter: Attracting birds’ year round means providing safe hiding places for homes and so you need planters that will support flowering shrubs, an evergreen or two, or even a small fruit-bearing tree where birds can feed and nest. Planters have to be heavy enough that a fully-grown shrub or tree won’t cause the planter to topple over (e.g., cast cement; wrought iron). If planting trees or shrubs with tangled growth for nesting isn’t feasible, you can always buy birdhouses. Check locally to see what birds to expect. Creating an environment for attracting birds and butterflies takes a little planning, but container gardening makes it easy.